Almost Finished! Watch for Grand Opening Announcement! Nautilus Dealers! We offer you a full range of shutter options! As a Nautilus Dealer you may not be aware that you also have access to a full range of products we manufacture for wholesale distribution. The HV Accordion System built with blade #1, #2, or #3 based on your particular application. Special radius accordion tracks for curved balconies and unique situations where your only option would be a segmented, welded track. Send us a pattern or measurements for a price quote. From 4 feet to 50 feet we can do them all. More products to come in 2016! We are the innovators! Call John at 239-940-2496 or john@nautilus-us.com for pricing information. Buying Radius Accordion Tracks from An Aluminum Distributor? 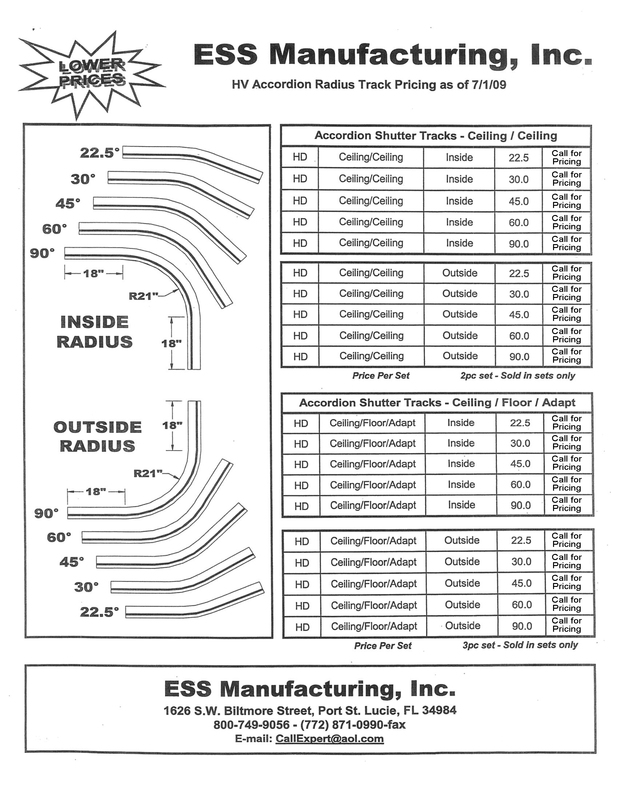 ESS Manufacturing builds radius accordion tracks for some large aluminum distributors who then pass their mark up on to you. Why not buy directly from the source and save 25% to 30% on each set of radius tracks? We build pairs of ceiling radius tracks for Town and Country for floor to ceiling applications that don�t require an adjustable floor track. They are available in inside or outside radius. We build pairs of radius tracks for the HV Accordion in ceiling to ceiling and also in ceiling to adjustable floor track. The adjustable floor track is the same as their standard track without the mounting flange. Both are available in inside and outside radius tracks. See the chart below for details and call John for pricing at 239-940-2496 or email john@nautilus-us.com.